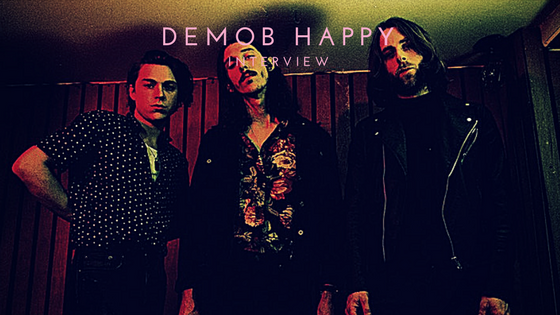 It’s been two years since Demob Happy released their debut album, Dream Soda, and after an extensive run promoting the album they are back with their latest single. Dream Soda was a DIY record from beginning to end and gave them a chance to learn what to do and what not to do this time around. They created an album that was exactly what they wanted to make with zero outside influences. “We got to deliver exactly the thing that we wanted to do and it definitely has paid off massively,” lead vocalist Matthew Marcantonio said. In the eyes of many, Dream Soda was one of the most underrated albums of 2015, if not one of the best. Since it left an impression on so many, it was imperative that they released something that was not only of equal likeness but enough to make up for the lack of releases since October 2015. “It wasn’t widely successful in any sort of way but the people who did hear it loved it and I think that’s down to the fact that we were able to just make exactly what we wanted to make but also put care and love and attention into it that made it into a singular thing,” Marcantonio said. “Dead Dreamers” is the first single from their next record off of Atlantic Records’ imprint Taste and Tone. It’s a bit of a departure from Dream Soda but there’s enough in there that holds onto that distinctive Demob Happy sound. This time around they wanted to create a track that was more of a universal message – giving them a real chance to shine in the United States. They played Austin, TX musical festival South by Southwest in 2016 – their first time in the states – and are hoping the feedback of “Dead Dreamers” gives them more opportunities on this side of the pond. In addition to releasing the new track, they have a game plan set in place based on how the first single is received. After spending two weeks with no distractions at a small cottage in Wales, their cabin fever style of writing paid off. “We want to do something that, having gotten past that point as just this expulsion of as many ideas that we could, is even more together in its root,” Marcantonio said. Marcantonio compares the compliments he’s received to his own music taste. “We’re thankful in the sense that people have been waiting and express excitement in the same way that I’m excited over a new Queen of the Stone Age record. To have people think that about our stuff is very odd feeling,” he said. While he is waiting for Villains to be released this summer, Demob Happy fans wait just as enthusiastically for their next release.